A frog is ony member o a diverse and lairgely carnivorous group o short-bodied, tailless amphibians componin the order Anura (Auncient Greek an-, withoot + oura, tail). The auldest fossil "proto-frog" appeared in the early Triassic o Madagascar, but molecular clock dating suggests thair oreegins mey extend forder back tae the Permian, 265 million years agae. Frogs are widely distributit, rangin frae the tropics tae subarctic regions, but the greatest concentration o species diversity is in tropical rainforests. Thare are approximately 4,800 recordit species, accoontin for ower 85% o extant amphibian species. Thay are an aa ane o the five maist diverse vertebrate orders. The bouk plan o an adult frog is generally chairacterised bi a stout body, protrudin een, cleft tongue, limms foldit unnerneath, an the absence o a tail. Besides leevin in fresh watter an on dry laund, the adults o some species are adaptit for leevin unnergrund or in trees. The skins o frogs are glandular, wi secretions rangin frae distastefu tae toxic. Warty species o frog tend tae be cried taids but the distinction atween frogs an taids is based on informal namin conventions concentratin on the warts raither nor taxonomy or evolutionary history. 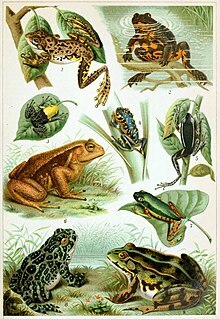 Frogs' skins vary in colour frae well-camouflaged dappled broun, gray an green tae vieve paiterns o bricht reid or yellae an black tae advertise toxicity an wairn aff predators. Frogs teepically lay their eggs in watter. The eggs hatch intae aquatic larvae cried tadpoles that hae tails an internal gills. Thay hae heichly specialised raspin mooth pairts suitable for yerbivorous, omnivorous or planktivorous diets. The life cycle is completit whan thay metamorphose intae adults. A few species deposit eggs on laund or bipass the tadpole stage. Adult frogs generally hae a carnivorous diet consistin o smaw invertebrates, but omnivorous species exist an a few feed on fruit. Frogs are extremely efficient at convertin whit thay eat intae bouk mass. Thay are an important fuid soorce for predators an pairt o the fuid wab dynamics o mony o the warld's ecoseestems. The skin is semi-permeable, makkin them susceptible tae dehydration, sae thay aither live in moist places or hae special adaptations tae deal that dry habitats. Frogs produce a wide range o vocalisations, pairteecularly in thair breedin saison, an exhibit mony different kynds o complex behaviours tae attract mates, tae fend aff predators an tae generally survive. Frogs are vailyied as fuid bi humans an an aa hae mony cultural roles in leeteratur, seembolism an releegion. Frog populations hae declined signeeficantly syne the 1950s. Mair nor ane third o species are conseedert tae be threatened wi extinction an ower ane hunder an twinty are believed tae hae acome extinct syne the 1980s. The nummer o malformations amang frogs is on the rise an an emergin fungal disease, chytridiomycosis, haes spreid aroond the warld. Conservation biologists are wirkin tae unnerstaund the causes o thir problems an tae resolve them. ↑ Stuart, S. N.; Chanson, J. S.; Cox, N. A.; Young, B. E.; Rodrigues, A. S. L.; Fischman, D. L.; Waller, R. W. (2004). "Status and trends of amphibian declines and extinctions worldwide" (PDF). Science. 306 (5702): 1783–1786. doi:10.1126/science.1103538. PMID 15486254. Wikimedia Commons haes media relatit tae Anura. This page wis last eeditit on 13 Februar 2018, at 05:15.